The Police Command in Kebbi today confirmed that a suspected herdsman had killed a policeman, Umaru Danladi, at Kaoge in Bagudo Local Government Area of the state. It said the herder, Babuga Kuaara, had already been arrested for the alleged offence, adding that the policeman was attached to the Kaoje Police Division in Bagudo local government area. The suspected herdsman was reported to the police division by a farmer in the area that the herder reared his cows to destroy his farm on Wednesday evening. 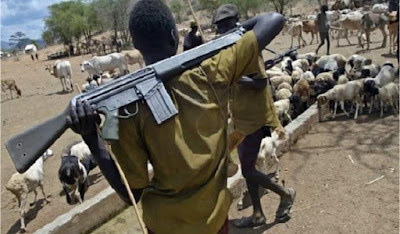 A witness who craved for anonymity, told newsmen on Thursday that ” a police officer attached to Kaoje police division was ordered to go and arrest the herder who was still wandering with his cattle within the area”. “The Police officer who came with his riffle, arrested the suspect, but as he was taking him to the waiting patrol vehicle,the herder drew his machete and stabbed the officer on his neck. “We saw the officer groaning in pains and bleeding but he died before we could apply first aid. “The herder was overpowered by officers who rushed to the scene,” the witness said. The Police Public Relations Officer (PPRO) in the state, DSP Mustapha Suleiman, told Journalists that the suspect had been arrested. ” We have arrested the herder, Babuga Kuaara, for killing the officer. He had confessed to the crime and will be prosecuted accordingly, “Suleiman said.